But will developers find it sufficiently tasty? 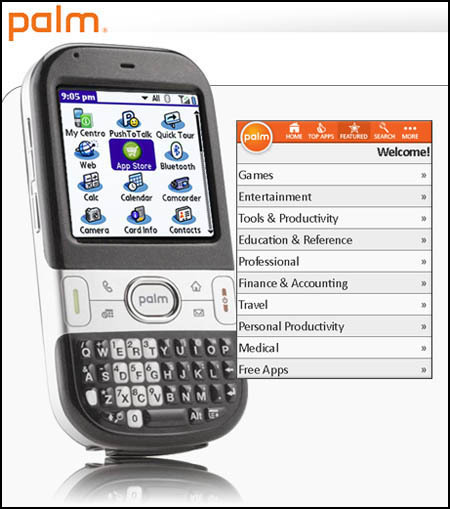 Palm today revamped its Software Store to allow Palm and Windows Mobile users to directly download 5,000 applications and games onto their mobile devices. The store's marketing rap promises support for "over 25 Palm devices, from the Centro to the Treo Pro," but doesn't offer any more system-support specifics. The store also claims more than "1500 Developers, 1000 Free Apps, 2000 Games," and "5000 Total Apps." The marketing site also displays a screenshot of the offering (seen below) in which the store's icon is labled "App Store." Although The Reg assumes that Apple may well agree that imitation is, indeed, the sincerest form of flattery, we also assume that Cupertino will soon protect its iTunes App Store's identity - if that smartphone call hasn't already been made. Our central question concerning Palm's Software/App Store isn't, as one might assume, "Why?" but rather "Why now?" After all, the company's Nova operating system is understood to be ready for release in a mere couple of weeks at CES. Perhaps Palm is hoping to instill a love of online app-shopping before Nova-based apps - and handsets - are available. If however, Palm is trying to pre-build a strong community of developers, it appears to be using an odd strategy - that of not paying them as high a percentage of return on their software as do Apple's App Store, the Android Market Place, and RIM's Application Center. According to the Washington Post, those first two online stores split the take 70/30, with the developer getting the larger cut. RIM's deal is even sweeter, at 80/20. Palm on the other hand, cuts the coin right down the middle at 50/50. No matter how you slice it - number of apps, well-motivated installed base, or sufficiently incentivized developers - Palm's online offering may be too weak to take on such mega-players as Apple, Google, and RIM. Remember when the Palm Pilot was the height of cutting-edge gadgetary goodness? To paraphrase Omar Khayyam, "The Moving Stylus writes; and, having writ, Moves on."